There you, the Virgin Mary, the Mother of God – given to me by your Son when you were at the foot of His Cross and by the Father’s Divine Will, to be also my Mother as the Mother of all mankind – suddenly stood, in the main aisle of the church; at the fifth pew from the top, standing right in the middle, with your hands clasped and eyes lifted upward toward God. You were silently but ever-so-recollectedly praying, while the priest was cleaning the sacred vessels toward the end of the Mass. Never in my life did I expect to see you! But there you were, standing determinedly upright at the other end of the pew where I was, quietly but surely answering my question; my prayer. Averaging no more than five feet seven in height and clothed fully in white, with a quarter-inch, light-blue ribbon running all around your floor-length mantle at about a half-inch inward from its edge, there you stood. 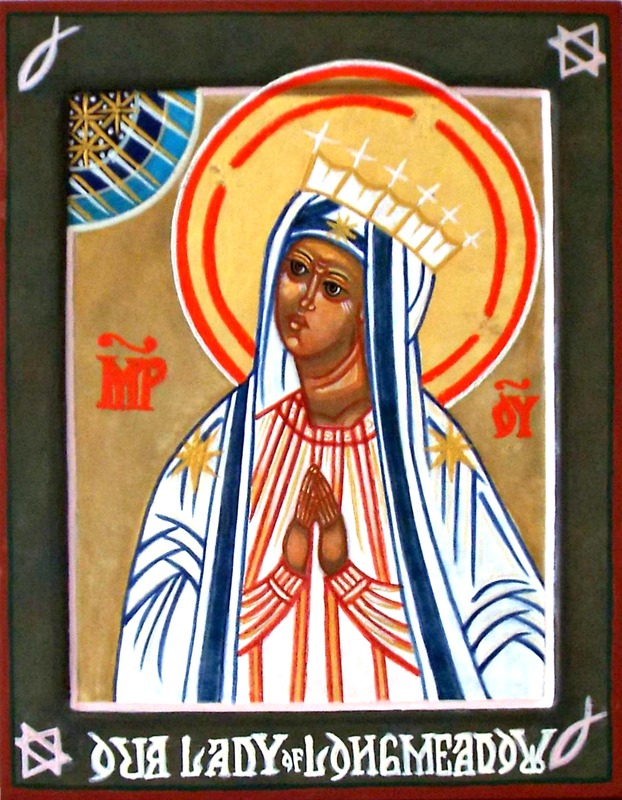 You came as the beautiful and immaculate Queen-Mother, with an upright crown of twelve stars on your head and not ceasing for an instant to pray; while maintaining your gaze unremittingly on the Triune God in Heaven. Not once did you look at the priest, neither did he notice you. In fact, the priest continued cleaning the sacred vessels attentively, completely oblivious to what was happening; despite the sharp, clanging noise of the kneeler falling – the sound which first drew my attention in your direction. You stayed there, quietly and recollectedly praying in the middle of the aisle for quite a few minutes. Then when the Mass ended, you left. However, by your externally visible and physically tangible presence that morning, you confirmed to me that the Masses held in that particular church were fully acceptable to God the Father. You also confirmed that this was the church – incidentally, a church named after you – I was to start attending, in keeping with the desires of the Father’s Divine Heart and Will. The above is a brief, experiential description – peira – of the Blessed Virgin Mary, the Mother of God. It is also an example of Her ceaseless, maternal care both of and toward us human beings, even when we do not invoke Her assistance directly or knowingly.